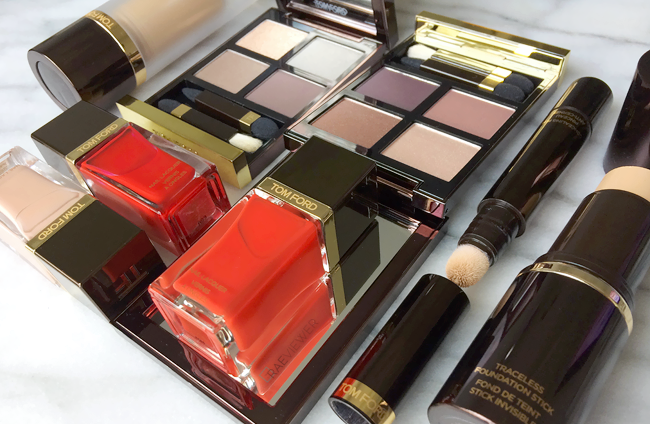 Since I rely so heavily on my favorite Tom Ford Beauty products, I wanted to share this brief brand guide to help you navigate and shop his permanent lineup! I adore the sparkly celestial eyeshadows in most of his eyeshadow quads, but if you prefer subtle shimmer/satin finishes, stick to Orchid Haze and the all-matte Cocoa Mirage! I do realize that glitter is not appropriate for the majority of office jobs and some women prefer smoother, refined eye colors. If, however, you enjoy the celestial formula — which is truly the best glitter formula on the market — do try patting them on with a clean fingertip. I do use a flat shader brush occasionally, but the fingertip trick eliminates all fall out! Most of my readers and subscribers know how incredibly sensitive and finicky my lips are. Tom Ford's satin and matte lip colors are some of the few formulas that do not irritate my lips! No peeling whatsoever and the pigmentation is always intense. I also wear the Bronzing Powder almost daily because I'm addicted to the finely milled matte texture. Plus the color isn't too warm aka orange, which I much prefer! The Concealing Pen is a new product that some seem to be on the fence about, but I think those with oily and combination skin will love the budge-proof formula. The coverage is about medium, but it brightens up my eyes so effectively! If you have dry eyes, make sure to prep with eye cream. I've covered the other products in my Top 10 repeatedly throughout the years, so please make sure to check out the reviews if you're interested in the details.